I keep getting requests to visit and review spas and their various services but i politely decline all such offers, the reason being I am not a spa or a massage person. For me the best way to rejuvenate and relax is a luxury bath at home which I have at least once every month. When the city pollution, summer heat and stress gets to me I take a break and enjoy a long extravagant bath right at my home in my very own bathroom. Make sure the temperature of water is right. A hot water bath strips your skin of moisture and is hardly relaxing. Even very cold water should be avoided as it can make you sick and can be chilling on your nerves and bones. Go for warm water and if you are having this luxury bath in winter let the water be a little bit more warmer and make it a bit cooler in summers. You are your body's best judge so decide what temperature works best for your body keeping the climate in mind. Our busy lives mean we always have bath in a rush. For a luxury bath timing is crucial. Pick a Saturday or sunday afternoon when there is no one around to disturb you into speeding up things. Relax and take your own time to soak in and calm your nerves. A relaxing bath gets better when you pamper your body with luxurious shower gels or soaps. If you want to try some new scented body washes, this is the right time to indulge in them. 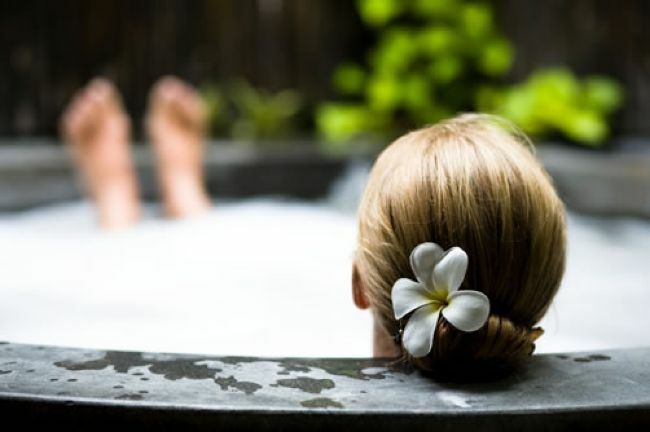 Fragrant shampoos, Ayurveda cleansers or your very own DIY hair wash or hair rinses can all be tried during your long relaxing bath of this kind. Try including bath salts as using bath salts is very soothing and can help you relax better. I always use bath salts when going for a luxurious bath . I add Soulflower Green tea and Tangerine bath salt to bath water tub and let it dissolve while I pamper myself with a luxury bath. You can even try Epsom salt instead of soulflower bath salt. Play your favourite soothing light music to create a relaxing atmosphere . You can hum along or just sing in your besura voice to drive the stress away. Create a pleasant and calm atmosphere. Sprinkle some fresh rose petal and mint leaves in your bath tub. If roses are not your thing you can go in for any other flower petals of your choice. Lightly darken your bath area and light up with tea lights or scented candles. If incense sticks is your thing then use even them. A relaxing bath is the best time to indulge in some light aromatherapy . Add some essential oils like lavender, lemongrass or rose oil to your bath water and soak in for 20 minutes to calm your mind, body and soul. While you soak in the essential oils and minerals from a bath salt dig into fresh fruits, salads and drinks. Avoid caffeine and carbonated drinks and opt for fresh and natural drinks like coconut water, fruit juices and lemonades. So are you ready to pamper yourself with a fantastico luxurious bath this weekend?